The Economist published an article last week exploring which head coaches are able to consistently lead their teams to overperform the overall talent level in the squad. This is one of the most important functions of a head coach, but not the only one. As we have argued before, in addition to winning on the weekend a manager should also be able to develop young players, in the process increasing the overall value of the squad and relieving pressure on the club’s transfer strategy. To understand why this is so important, one doesn’t need to look any further than Real Madrid and Zinedine Zidane. Measured by trophy haul, Zidane is undeniably one of the most successful managers of all time. Nevertheless, during his years in charge Real Madrid failed to develop a new generation of talent who would be able to maintain performance levels when the old guard stepped down. As a result, Real Madrid have entered a period of rapid decline as their best players age past their peak years, a decline that likely can’t be arrested without significant expenditure in the transfer market. By looking at the effect managers had on the 21st Club Player Contribution rating of the young players they managed, we can assess how effective they are at continuously improving the abilities of the young players in their squad. 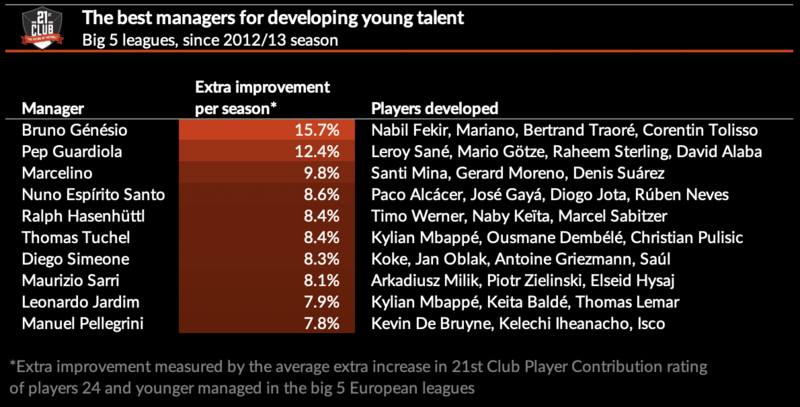 Take the example of Lyon’s Bruno Genésio, our top rated manager in terms of developing young talent. An average young player will tend to improve his 21st Club Player Contribution rating by 5.9% per season. Players under Génésio’s management have improved by an average of 21.6% per season, and thus we can infer that Génésio can add an extra 15.7% per season to a player’s development. Since taking over Lyon in 2015, he was instrumental in developing players such as Alexandre Lacazette, Samuel Umtiti, and Corentin Tolisso, who went on to be sold, while successfully developing replacements in Memphis Depay, Bertrand Traoré, Tanguy NDombele, and others. His willingness to give young players a chance and skill at improving their abilities meant that Lyon were able to sell several young players for substantial fees while maintaining their high performance level. Although Lyon’s results are no better than when he started, he has been invaluable to the club. Winning is not enough – the long-term financial health of a football club requires winning in a responsible way, with an eye on the future. When deciding on a new manager, it is important to make sure he is not only a good tactician, but also someone who can develop good players – the benefits of this approach will last for several seasons.